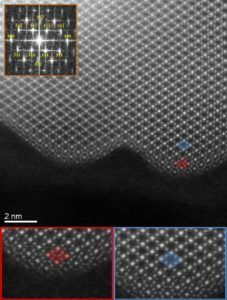 The Atomic Structure-Composition of Materials group focus on the study of the atomic structure, atomic composition and defect behavior of nanomaterials, through in-situ TEM, high-resolution TEM, aberration-corrected TEM/STEM, precession microscopy and EELS/EDS techniques. In particular, the group is interested in understanding the relationships between the atomic structure, composition and the properties of nanomaterials, and the fundamental underlying mechanisms of structural and property changes induced by crystalline defects. The material systems of interest include Li-ion oxides for batteries, proton exchange membranes fuel cells, catalyst nanoparticles and nanoscale particles, wires and thin films. Nanostructures for Multifunctional Properties: Oxygen Scavengers, Chromatic sensors and Antibacterial agents with Dr. Sebastian Calderon (INL) and Prof. Sandra Carvalho (Univ. of Minho). 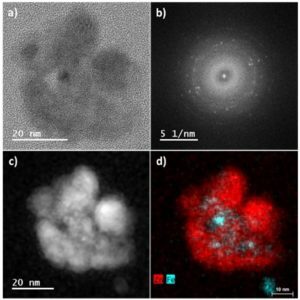 Bimetallic Nanoparticles a) Phase contrast Image, b) FFT of a), c) HAADF STEM image d) EDX spectrum images. The development of materials sensitive to oxygen and able to detect it, is one of the main aims in the packaging industry, even 2% residual oxygen concentration may alter food organoleptic properties. The presence of oxygen in the packaging, as well as the permeation of oxygen during storage is avoided by using oxygen scavenging materials and controlled by using packaging materials with low permeability to gases. Most of the commercial active agents used on packaging materials are dispersed in the film matrix or/and used as sachet, cards, and self-adhesive labels that can lead to an inefficient activity of the active compound. Thus, the incorporation of the oxygen scavengers in the packing materials avoids the necessity of additional components. However, the use of these materials do not give information of the level of oxygen inside the packaging or avoid the microbial growth during storage that can happen in the presence of oxygen, and thus acting as intelligent and active packaging. This project addresses the development of a new generation of active and intelligent packaging film for foods through the dispersion of nano-sized multifunctional particles in a bio-polymeric matrix. The enhanced oxygen absorption capacity, antimicrobial properties and changes in colour as a function of oxygen absorption will provide the packaging material with the multifunctional characteristics required to enlarge the shelf-life of the food. The surface of materials is one of the most important aspects of electrochemistry. The surface is where all critical charge transfers and catalytic interactions occur. For Li-ion batteries, the surface of the electrodes dictates the reactivity with the electrolyte, the ability for Li-ions to shuttle between the bulk and the electrolyte, and the rate at which the ions can transfer, all of which has an effect on rate-capability and cyclability. LiMn2O4 (LMO) and LiNi0.5Mn1.5O4 (LNM) are both promising cathode materials with high energy density and high rate capability, but both are plagued with cyclability problems based on surface effects. In the LMO system the main contributor to cycling degradation is the Mn disproportionation reaction (2Mn3+ = Mn2+ + Mn4+) which creates soluble Mn2+ that is lost to solution. In the LNM system, the redox-active Ni reacts with the electrolyte at the surface of the cathode leading to cathode electrolyte interphase (CEI) formation, which reduces cyclability by creating an increasingly thicker interphase that slows Li diffusion to and from the cathode. Between LMO and LNM, LNM is the more desirable cathode material due to the higher voltage (~4.7 V vs Li0/+ as compared with ~4 V vs Li0/+ for LMO) of the Ni2+/3+ and Ni3+/4+ redox couple with equivalent capacity. HAADF STEM image of LMO viewed along the  zone axis. A blue diamond, indicative of the LiMn2O4 cubic spinel structure, is shown in the bulk while a Mn3O4 phase (red diamond) is visible at the surface. A fast Fourier transform (FFT) of the original full image is included to indicate the crystal. Since LMO has fewer cations than LNM while still containing the cubic spinel structure, we first studied the LMO cathode system using a combination of high-angle annular dark-field (HAADF) aberration-corrected scanning transmission electron microscopy (STEM) (Figure) and electron energy loss spectroscopy (EELS) to confirm the underlying spinel structure, and we have found, in as-processed LMO, a surface structure composed of Mn3O4 and a lithium-rich Li1+xMn2O4 subsurface layer which occurs as a result of surface reconstruction. We have also identified that oxygen deficiency is the mechanism by which the surface reconstruction occurs. This research project seeks to study the surface of LNM using a similar approach as that used for the study of LMO and identify the role that Ni plays in the surface reconstruction of LNM. INL is the ideal place to study LNM with their image and probe corrected FEI Titan TEMs, which have HAADF STEM and EELS capabilities. We will use HAADF STEM techniques to identify atomic surface structures and EELS to identify Ni and Mn oxidation states. With the collected information, inferences will be made as to why and how the surfaces of these spinel cathode materials reconstruct and conclusions may be made about their electrochemical performance once inside a battery. With the advancements of nanotechnology, particles can be synthesized in a controlled way, for example with crystallographic morphologies/faces and desired sizes, in order to improve the performance of these materials in a specific applications. Photocatalysis is a promissing technology application in a wide variety of chemical and environmental technologies, for example in the conversion of solar energy into chemical energy and to remove pollutants on liquid and gaseous environmental. In this technique semiconductors are use as photocatalysts and their photocatalytic activity and the mechanism of the photocatalytic reaction are influenced by the crystalline structure, defects and impurities, surface morphology and interface (photocatalyst/environment), among other factors. In this context, nanostructured TiO2 has been prominent in photocatalytic applications where it is a crystal structure, size (surface area) and morphology (exposed facets) are important. The materials studied in this work are synthesized through calcination of trititanate nanotubes (TTNT) previous synthesized by alkaline hydrothermal route. The morphology of the synthesized materials does not always assume a form of equilibrium of its natural phase and is not completely know, being this an important characteristic for a photocatalytic activity. TEM image from one particle of TiO2 nanorod synthesized at 550°C calcination of TTNT (a) with FFT square (b) and a HRTEM image of the same particle showing two planes and angle between them (c). The higher the surface energy of the exposed faces of the material, the greater its photocatalytic activity, consequently better results of photocatalysis. The relationship between agent of a police material and its nanostructure can be well elucidated through different electron microscopy techniques. Transmission electron microscopy (TEM) is a more complete technique for a nanoscale characterization of crystal structure and morphology. From this, grain size, morphology, crystallography, chemical composition, phase determination, particle coalescence, etc. can be obtained. The main objective of the project is to use TEM advanced techniques to characterize TiO2-based nanomaterials synthesized from post-heat treatment of TTNTs, allowing a study and understanding of the entire synthesis process, such as nanomaterials and correlating the morphology of each nanomaterial with their photocatalytic properties. Dental implants are usually fabricated using titanium (Ti) based materials due to its biocompatibility and good corrosion resistance. However, the low capacity to form a strong chemical bond with living tissue, known as bioactivity, is one of drawbacks of Ti dental implants. Tantalum (Ta) and tantalum oxide coatings have been proven bioactive materials and recently proposed to enhance osseointegration and performance of medical devices such as dental implants. Ta is bioactive and exhibits high wettability and high surface energy, which promotes high osseointegration and good corrosion resistance. On the other hand, the higher surface energy of tantalum oxides stimulates the regeneration process in living tissues, and thus, increases the osseointegration efficiency. Also, nanostructured surfaces enhance surface-protein interaction, bioactivity and osteoblast adhesion that play a fundamental role in bone ingrowth. (a) Top surface (SEM) and (b) cross-section (STEM) of nanoporous tantalum oxide produced by anodization process. In this work, Ta-based coatings are deposited by DC magnetron sputtering onto Ti CP substrates in an Ar+O2 atmosphere. Moreover, nanostructured anodic tantalum oxide is successfully prepared by electrochemical deposition onto Ta sheets. Ta1-xOx coatings with different oxygen content were successfully deposited by reactive magnetron sputtering. The increase of oxygen content in the coatings change the morphology from columnar to featureless. Likewise, oxygen incorporation inhibits the grain growth and thus the initial formation of a metallic crystalline structure changes to an amorphous phase. On the other hand, the anodisation process reveals that the electrolyte, composed by H2SO4 and HF, in a 15-30V potential range, allows us to control the Ta interconversion from nanopores assemblies to nanotubes array. The control of the nanostructures (nanopores or nanotubes) size is critical for their final properties. Example of segmentation results from our state of the art particle picker. Nanoparticles play important roles in a number of different fields, and many of their properties show a strong dependence on size and shape (i.e., their morphology). 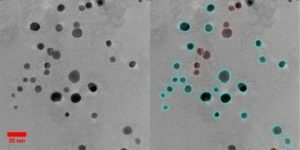 There are numerous analytical methods used to characterize their morphologies, and transmission electron microscopy represents a highly attractive option because it allows for the real space visualization of NPs. However, subsampling presents a large source of uncertainty when using this method, as many particle size distributions (PSDs) are drawn from a small sample size typically on the order of 100 particles. Subsampling arises primarily from the complexity of TEM micrographs, which often precludes the automated segmentation and sizing of NPs. The consequent need to manually segment NPs in TEM micrographs represents a bottleneck that must be overcome to address the crucial problem of subsampling. We have developed a state of the art particle picker to address this gap. The Figure above contains an example of segmentation results from this particle picker. Ataxin-3 (Atx3) is one of nine proteins containing an expandable polyglutamine (polyQ) repeat segment that are associated with late-onset human neurodegenerative diseases. Aggregation of the non-pathological and polyQ-expanded Atx3 is well characterized and is critically dependent on early self-assembly events modulated by its globular Josephin domain. PolyQ expansion beyond a certain threshold elicits a second (polyQ-dependent) aggregation step that is critical to mature fibril generation. Biophysical studies unveiled the Atx3 multistep aggregation pathway, but structural data on the nature of the intermediates formed is still lacking. 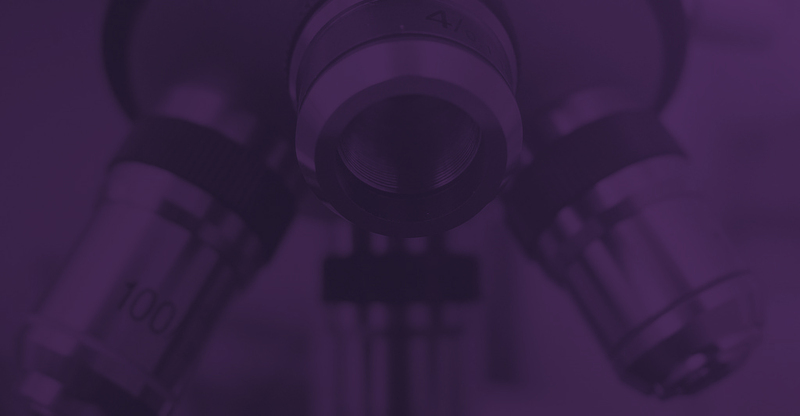 To uncover the structural aspects of Atx3 aggregation intermediates, advanced electron microscopy and optical microscopy approaches will be used. Proton exchange membrane fuel cells (PEMFCs) are promising power sources for transport and stationary applications. Pt and Pt-alloy nanoparticles are currently used as the catalyst to promote the kinetics of the hydrogen oxidation and oxygen reduction reactions in the anode and cathode of the fuel cell, respectively. Yet, the efficiency of PEMFC is largely restricted by the instability of catalyst nanoparticles during fuel cell operation. Due to their large surface area-to-volume ratio, Pt and Pt-alloy nanoparticles have a strong tendency to grow in size over short time scales, which lead to a reduction in their electrochemically active surface area, and consequently to an undesired catalyst deactivation and reduction in cell performance after several cycles. In this context, it is still challenging to fully understand 1) the interactions between the carbon support and Pt and Pt-alloyed nanocatalysts in the cathode and 2) the degradation mechanisms of the Pt and Pt-alloy nanocatalysts under the fuel cell environment. To address these issues, the first goal of this work is to understand the effects of different parameters, such as the potential cycling profile, temperature, and atmosphere on the degradation of carbon supports. Different kinds of carbon supports, including amorphous carbon, carbon nanotubes and graphene, with the following characteristics: i) with and without functionalization combined with ii) loaded and unloaded with Pt and Pt-alloyed nanocatalysts, will be first studied by high resolution transmission electron microscopy (HRTEM), scanning transmission electron microscopy (STEM) and EDS (Fig.1). Subsequently, the aforementioned samples will be characterized before and after cycling, in the same exact location, using identical location transmission electron microscopy (ID-TEM). In addition, to better understand the interaction between the carbon supports and catalysts, we will perform 3-D TEM tomography. The second goal of this work is to distinguish between the roles played by particle migration and electrochemical Ostwald ripening as degradation mechanisms. In this regard, a special MEMS chip will be designed to be used inside an electrochemical cell TEM holder to perform, for the first time, in-situ TEM experiments of a PEMFC in real time. In summary, the work proposed above will provide a systematic study on the effects of fuel cell operation conditions on the degradation of carbon supports, as well as on the degradation mechanisms of Pt or Pt-alloyed catalysts in the cathode. Cast duplex stainless steels (DSS) have been applied in highly corrosive conditions, such as marine environments (oil and gas), chemical and petrochemical industry, as well as pulp and paper industry. The superior performance of these material is achieved by a balanced microstructure, consisting of approximately equal amounts of ferrite (α) and austenite (γ) in the as-heat treated condition. In terms of mechanical properties, the balanced microstructure is beneficial to obtain high toughness and high strength, when compared to austenitic stainless steels with same corrosion resistance. In the most severe applications, DSS grades with high Cr, Ni, Mo and N are required, to ensure the best performance in terms of pitting, stress and inter-crystalline corrosion. Among these DSS, the so-called super (SDSS) and hyper grades (HDSS) contain even higher Cr and N contents, when compared with other DSS grades. As a consequence, these grades are prone to the formation of detrimental secondary phases, in particular sigma (σ) and chi (χ). The destabilization of duplex microstructure is more pronounced on thick areas of casting components. The primary objective of this project is to characterize among several different secondary phases that may form during casting of large DSS components and to establish kinetic models for their formation, by means of correlate the information collected on optical microscopy, as well the scanning and transmission electron microscopy techniques. BSE-SEM image of DSS containing α, γ, χ- and σ-phases, ascending ordered by brightness levels. On right side, the distribution of principal thermal residual stresses. The maximum stresses are concentrated on interfaces between α (lower coefficient of thermal expansion) and the γ, χ- and σ-phases areas. Currently, a methodology to identify χ- from σ-phases has been presented, which allow us to measure their volume percent. Therefore, volume percent measurements are critical data to establish the kinetic models of each phase, to tailor the appropriate cooling cycle. The methodology is based on matching between different the grey levels of χ- from σ-phases on BSE-SEM images with semi-quantitative chemical analysis with aid of EDS. Therefore, the semi-quantitative analysis on SEM are compared with measurements by means of TEM-EDS. In fact, TEM plays a key role on characterization methodology, due to electron diffraction capability in order to unequivocally identify χ- and σ-phases. Finally, as the identification is complete, an image segmentation procedure can be applied to BSE-SEM images. Apart from the kinetics description of secondary phases formation, being able to detect and identify all the phases that may be present on DSS castings allows us to study how their distribution can affect the magnitude and gradient of thermal residual stresses. A finite element method has been used, where BSE-SEM images are inputs and it is possible to assign the elastic properties (Young’s modulus and Poisson’s ration) and coefficient of thermal expansion to individual phases. The application of a thermal gradient, the software calculates maps of distribution of principle stresses. In fact, due to significant differences in terms of coefficient of thermal expansion, thermal residual stresses arise and interfaces acts as concentration areas of stresses. The mechanical properties of nanocrystalline thin films are strongly related to their grain size according to the Hall-Petch equation. However, in materials with nano grain sizes, rapid and abnormal grain growth may occur when subjected to heating during manufacture or usage, which will decrease their strength. In addition, as grain growth occurs, the local texture may evolve, which also affects the mechanical properties. In this context, the goal of this work is to develop a thorough study on how grain growth and local texture of copper and nickel thin films may be affected by the deposition method, substrate, film thickness and annealing temperature. In order to determine the grain size and texture in nano grain size materials, traditional techniques such as Electron Backscattered Diffraction (EBSD) can no longer provide the resolution required. Therefore, a technique called Precession Electron Diffraction Microscopy, which provides a spatial resolution of 3-5nm and minimizes dynamical diffraction effects in TEM, will be performed. This technique will allow us to investigate the grain orientation, average grain size and grain boundary information in a fully automated fashion. Furthermore, to improve the Precession analysis, a newly developed method will be used where the diffraction patterns are filtered for noise threshold, spot enhance loop, gamma, spot radius and softening loop. In this fashion, the reliability of the results will be improved. Finally, the orientation images acquired after indexing will then exported to the TexSEM Laboratories Orientation Imaging (TSL OIMTM) software for further filtering. Two sets of samples will be studied by Precession Electron Diffraction in TEM. The first set of samples correspond to nickel and copper thin films with thicknesses of 30nm and 120 nm deposited on NaCl crystals at room temperature by pulsed laser deposition (PLD) and sputtering. The second set of samples are copper thin films with thicknesses of 30nm, 120nm and 900 nm deposited on Ta/SiO2/Si substrates by using sputtering. The first set of samples will be subjected to an annealing temperature of 350 C for various times to monitor the evolution of grain size and texture. The second set of samples will be subjected to two treatments of 700 C and 900 C and three different times. In summary, this work will enable us to correlate between grain size, local texture, deposition method, substrate, film thickness and annealing temperature in Ni and Cu nanocrystalline thin films. 2. M. Gonçalves, R. F. P. Pereira, P. Ferreira, E. Carbo-Argibay, J. Catita, G. Toquer, S. C. Nunes, V. DE Zea Bermudez “Structuring of Di-Alkyl-Urethanesils”, Journal of Sol-Gel Science and Technology (2018) (in press). 3. Sitaramanjaneva Mouli Thalluri, Jerome Borme, Kang Yu, Junyuan Xu, Isilda Amorim, Joao Gaspar, Liang Qiao, Paulo Ferreira, Pedro Alpuim, and Lifeng Liu, “Conformal and continuous deposition of bifunctionalcobalt phosphide layers on p-silicon nanowire arrays for improved solar hydrogen evolution”, Nano Research, (in press), 2018. 16. Charles Amos, Manuel Roldan, Maria Varela, John Goodenough, Paulo Ferreira, “Revealing the Reconstructed Surface of Li[Mn2]O4”, Nanoletters, Vol. 16, pp 2899–2906 (2016). 19. James A Gilbert, A Jeremy Kropf, Nancy N Kariuki, Stacy DeCrane, Xiaoping Wang, Somaye Rasouli, Kang Yu, Paulo J Ferreira, Dane Morgan, Deborah J Myers, “In-Operando Anomalous Small-Angle X-Ray Scattering Investigation of Pt3Co Catalyst Degradation in Aqueous and Fuel Cell Environments”, Journal of The Electrochemical Society, Volume 162, pp. F1487-F1497 (2015). 20. Mallika Gummalla, Sarah C. Ball, David A. Condit, Somaye Rasouli, Kang Yu, Paulo J. Ferreira, Deborah J. Myers, Zhiwei Yang, “Effect of Particle Size and Operating Conditions on Pt3Co PEMFC Cathode Catalyst Durability”, Catalysts, Volume 5, pp. 926-948, 2015. 22. Kang Yu, Daniel J. Groom, Xiaoping Wang, Zhiwei Yang, Mallika Gummalla, Sarah C. Ball, Deborah J. Myers, and Paulo J. Ferreira, “Degradation Mechanisms of Platinum Nanoparticle Catalysts in Proton Exchange Membrane Fuel Cells: The Role of Particle Size”, Chemistry of Materials, Volume 26, pp 5540–5548 (2014). 23. Katayun Barmak, Amith Darbal, Kameswaran J. Ganesh, Paulo J. Ferreira, Jeffrey M. Rickman, Tik Sun, Bo Yao, Andrew P. Warren, Kevin R. Coffey, “Surface and grain boundary scattering in nanometric Cu thin films: A quantitative analysis including twin boundaries”, Journal of Vacuum Science and Technology, 32, 061503 (2014). 24. M.A. Asoro, P.J. Ferreira, D. Kovar, “In Situ TEM and STEM Studies of Sintering of Ag and Pt Nanoparticles”, Acta Materialia, Volume 81, pp. 173–183 (2014). 26. M.A. Asoro, D. Kovar, P.J. Ferreira, “Effect of surface carbon coating on sintering of silver nanoparticles: in situ TEM observations”, Chemical Communications, Vol. 50, pp. 4835-4838, (2014). 27. Karalee A. Jarvis, Chih-Chieh Wang, Arumugam Manthiram and Paulo J. Ferreira, “The role of composition in the atomic structure, oxygen loss, and capacity of layered Li–Mn–Ni oxide cathodes”, Journal of Materials Chemistry A, Vol. 2, pp. 1353 – 1362, (2014). 28. Michael Asoro, Desiderio Kovar, Paulo Ferreira, “In-situ Transmission Electron Microscopy Observations of Sublimation in Silver Nanoparticles”, ACS Nano, Vol. 7, pp. 7844-7852, (2013). 29. Chih-Chieh Wang, Karalee A. Jarvis, P.J. Ferreira and A. Manthiram, “Effect of synthesis conditions on the first charge and reversible capacities of lithium-rich layered Oxides”, Chemistry of Materials, Vol. 25 (15), pp. 3267–3275, (2013). 30. Linjun Cao, K. J. Ganesh, Lijuan Zhang, Oliver Aubel, Christian Hennesthal, Meike Hauschildt, Paulo J. Ferreira, and Paul S. Ho, “Grain structure analysis and effect on electromigration reliability in nanoscale Cu interconnects”. Applied Physics Letters, Vol. 102, pp. 131907-1:131907-4, (2013). 31. J. T. Graham, G.L. Brennecka, P.J. Ferreira, L. Small, D. Duquette, C. Apblett, S. Landsberger and J.F. Ihlefeld, “Neutron irradiation effects on domain wall mobility and reversibility in lead zirconate titanate thin films”, Journal of Applied Physics, Vol. 11, pp. 124104-124109, (2013). 32. B. Patrick, H. Ham, Y. Shao-Horn, L. Allard, G. Hwang, P.J. Ferreira, “Atomic Structure and Composition of “Pt3Co” Nanocatalysts in Fuel Cells: An Aberration-Corrected STEM HAADF Study”, Chemistry of Materials, Vol. 25, pp 530–535, (2013). 33. A. Darbal, K. J. Ganesh, X. Liu, S.-B. Lee, J. Ledonne,T. Sun, B. Yao, A. P. Warren, G. S. Rohrer, A. D. Rollett, P. J. Ferreira, K. R. Coffey, and K. Barmak, “Grain Boundary Character Distribution of Nanocrystalline Cu Thin Films Using Stereological Analysis of Transmission Electron Microscope Orientation Maps”, Microscopy and Microanalysis, Vol. 19, pp. 111-119, (2013). 34. C.E. Carlton, P.J.Ferreira, “In-situ TEM Nanoindentation of Nanoparticles”, Micron, Special Issue, Vol. 43, pp. 1134-1139, (2012). 36. S. Rajasekhara, K. Hattar, K. J. Ganesh, J. A. Knapp, P. J. Ferreira, “Evidence of metastable hcp phase grains in as-deposited nanocrystalline nickel films”, Scripta Materialia, Vol. 67, No. 2. pp. 189-192, (2012). 37. K.A. Jarvis, Z.Q. Deng, L. F. Allard, A. Manthiram, and P.J. Ferreira, “Understanding structural defects in lithium-rich layered oxide cathodes”, Journal of Materials Chemistry, Vol. 22 (23), pp. 11550 – 11555, (2012). 39. Christopher E. Carlton, Shuo Chen, Paulo J. Ferreira, Lawrence F. Allard, and Yang Shao-Horn, “Sub-Nanometer-Resolution Elemental Mapping of “Pt3Co” Nanoparticle Catalyst Degradation in Proton-Exchange Membrane Fuel Cells”, The Journal of Physical Chemistry Letters, Volume: 3 Issue: 2 Pages: 161-166 (2012). 41. Daniel R. Dreyer, Karalee A. Jarvis, Paulo J. Ferreira, and Christopher W. Bielawski, “Graphite Oxide as a Dehydrative Polymerization Catalyst: A One-Step Synthesis of Carbon-Reinforced Poly(phenylene methylene) Composites”, Macromolecules, Vol. 44, pp.7659-7667 (2011). 42. K. Jarvis, Z. Deng, L.F. Allard, A. Manthiram, P.J. Ferreira, “Atomic Structure of a Lithium-Rich Layered Oxide Material for Lithium-ion Batteries: Evidence of a Solid Solution”, Chemistry of Materials, 23, 16, pp. 3614-3621, (2011). 44. S. Rajasekhara, B. H. Neuner III, G. Ferro, C. A. Zorman, G. Shvets, P.J.Ferreira and D. Kovar, “The influence of impurities and planar defects on the infrared properties of silicon carbide films”, Applied Physics Letters, 98, 191904, (2011). 45. J. Zhao, K. Jarvis, P.J. Ferreira, and A. Manthiram, “Performance and stability of Pd–Pt–Ni nanoalloy electrocatalysts in proton exchange membrane fuel cells” Journal of Power Sources, Vol.196, 10, pp. 4515-4523, (2011). 46. S. Rajasekhara, P.J. 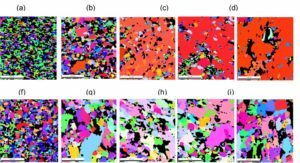 Ferreira, “Martensite austenite phase transformation kinetics in an ultrafine-grained metastable austenitic stainless steel”, Acta Materialia, Vol.59, pp. 738-748, (2011). 47. A. Velamakanni, J.R. Torres, K.J. Ganesh, PJ. Ferreira, J.S. Major, “Controlled Assembly of Silane-Based Polymers: Chemically Robust Thin-Films”, Langmuir, Vol.26, pp. 15295-15301, (2010). 49. K.J. Ganesh, S. Rajasekhara, J.P. Zhou, P.J. Ferreira, “Texture and stress analysis on 120 nm copper interconnects”, Scripta Materialia, Vol.62, pp.843-846 (2010). 50. S. Simões, R. Calinas, M.F. Vieira, M.T. Vieira, P.J. Ferreira “In-situ TEM study of grain growth In nanocrystalline copper thin films”, Journal of Nanotechnology, Vol. 21, pp. 145701 (2010). 51. A. Velamakanni, C.W. Magnuson, K.J. Ganesh, Y.W. Zhu, J.H. An, PJ. Ferreira, R.S. Ruoff, “Site-Specific Deposition of Au Nanoparticles in CNT Films by Chemical Bonding” ACS NANO, Vol. 4, Issue: 1, pp. 540-546 (2010). 53. M.A.Asoro, D. Kovar, Y. Shao-Horn, L.F. Allard, P.J. Ferreira, “Coalescence and sintering of Pt nanoparticles: In-situ observation by aberration-corrected HAADF STEM”, Journal of Nanotechnology, Vol. 21, pp. 025701-025706 (2010). 54. I.M. Robertson, P.J. Ferreira, B. Clark, Guest Editors, “In-situ Transmission Electron Microscopy Methods”, Microscopy Research and Technique, Special Issue, March 2009, Volume 72, Issue 3, pp.121-292. 55. Aruna Velamakanni, K. J. Ganesh, Yanwu Zhu, P. J. Ferreira, Rodney S.
Carbide Nanowires”, Advanced Functional Materials, Vol. 19, pp. 1-8, (2009). 56. A. Vadivel Murugan, T. Muraliganth, P. J. Ferreira, and A. Manthiram, “Dimensionally Modulated, Single-crystalline LiMPO4 (M=Mn,Fe,Co, and Ni) with Nano-Thumblike Shapes for High-Power Energy Storage,” Inorganic Chemistry, Vol. 48, pp. 946-952, (2009). 57. Shuo Chen, Wenchao Sheng, Naoaki Yabuuchi, Paulo J. Ferreira, Lawrence F. Allard and Yang Shao-Horn, “Origin of Oxygen Reduction Reaction Activity on “Pt3Co” Nanoparticles: Atomically Resolved Chemical Compositions and Structures”, Journal of Physical Chemistry C, Vol. 113, pp. 1109-1125, (2009). 59. P.J. Ferreira, E. Stach, K. Mitsuishi, Guest Editors, MRS Bulletin, “In-situ Transmission Electron Microscopy”, February 2008, Volume 33, No.2. 60. C.E. Carlton, L. Rabenberg, P.J. Ferreira, “On the nucleation of partial dislocations in nanoparticles”, Philosophical Magazine Letters, Vol. 88, No 9-10, pp. 715-724, (2008). 62. C. E. Carlton, P.J. Ferreira, “Dislocation motion-induced strain in nanocrystalline materials: Overlooked considerations”, Materials Science and Engineering A, 486, pp. 672-674, (2008). 63. R. Perez-Bustamante, I. Estrada-Guel, W. Antunez-Flores, M. Miki-Yoshida, P.J. Ferreira, R. Martinez- Sanchez, “Novel Al-matrix nanomcomposites reinforced with multi-walled carbon nanotubes”, Journal of Alloys and Compounds, Vol. 450, Issue 1-2, pp. 323-326, (2008). 64. I.M. Robertson, P.J. Ferreira, G. Dehm, R. Hull, E.A. Stach, “Visualizing the Behavior of Dislocations – Seeing is Believing”, MRS Bulletin, Vol. 33, No.2, pp. 122-131, (Feb. 2008). 65. Y. Shao-Horn, W.C. Sheng, S. Chen, P.J. Ferreira, E. Holby, D. Morgan, “Instability of Supported Platinum Nanoparticles in Low-Temperature Fuel Cells”, Topics of Catalysis, 46, (3-4), pp. 285-305, (2007). 68. C. E. Carlton, P.J. 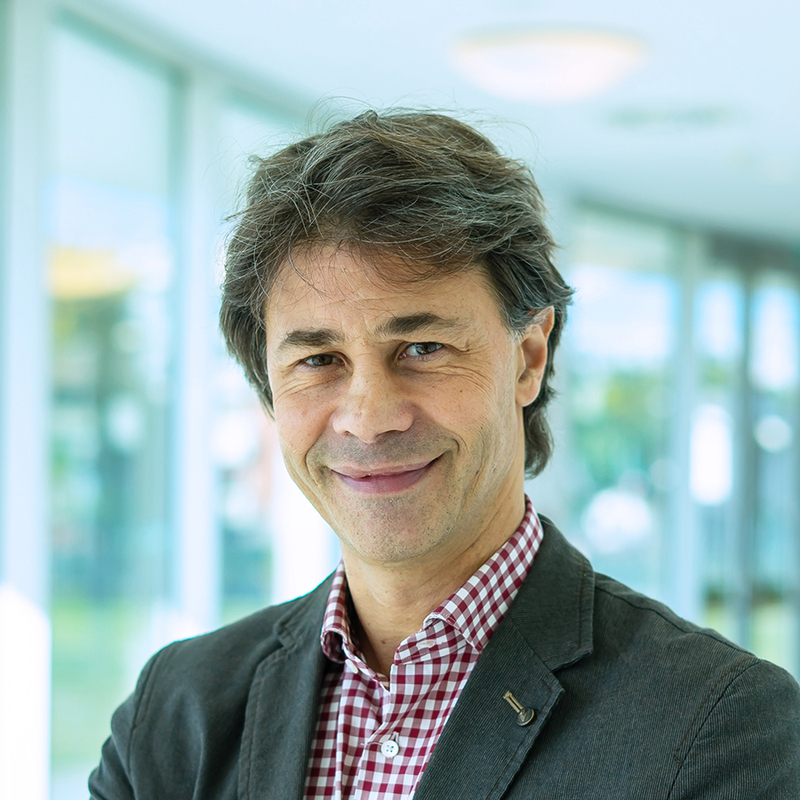 Ferreira, “What is Behind the Inverse Hall-Petch Effect in Nanocrystalline Materials?”, Acta Materialia, Vol. 55, pp. 3749-3756 (2007). 69. P.J. Ferreira, Y. Shao-Horn, “Formation Mechanism of Pt Single-Crystal Nanoparticles in Proton Exchange Membrane Fuel Cells”, Electrochemical and Solid State Letters, 10, (3), B60-B63 (2007). 70. J. H. An, P.J. Ferreira, “In-situ Transmission Electron Microscopy Observations of 1.8 micron and 180 nm Cu Interconnects Under Thermal Stresses”, Applied Physics Letters, 89, 151919, pp. (2006). 71. D.L. Johannsen, A. Kyrolainen, P.J. Ferreira, “Influence of Annealing Treatment on the Formation of Nano/Submicron Grain Size AISI 301 Austenitic Stainless Steels”, Metallurgical and Materials Transactions, Vol.37, 8, pp. 2325-2338, (2006). 72. V. Raguveer, P.J. Ferreira, A. Manthiram, “Comparison of Pd–Co–Au electrocatalysts prepared by conventional borohydride and microemulsion methods for oxygen reduction in fuel cells”, Electrochemistry Communications, Vol.8, 5, pp. 807-814, (2006). 75. Bruce Y.C. Wu, P.J. Ferreira and Christopher A. Schuh, “Nanostructured Ni-Co Alloys with Tailorable Grain Size and Twin Density”, Metallurgical and Materials Transactions, Vol.36, 1927, (2005). 76. Chinedum Osuji, P.J. Ferreira, Guoping Mao, Christopher K. Ober, J.B. Vander Sande, Edwin L. Thomas, “Alignment of Self-Assembled Hierarchical Microstructure in Liquid Crystalline Diblock Copolymers Using High Magnetic Fields”, Macromolecules 37 (26): 9903-9908 (2004). 77. P. J. Ferreira, J. B. Vander Sande, M. A. Fortes and A. Kyrolainen; “Microstructure Development During High-Velocity Deformation”, Materials and Metallurgical Transactions A, 35A, pp.3091, 2004. 78. De Deus, M. A. Fortes, P. J. Ferreira and J. B. Vander Sande; “A General Approach to Grain Growth Driven by Energy Density Differences”, Acta Materialia, 50, 3317, 2002. 80. E. Cecchetti, P. J. Ferreira and J. B. Vander Sande; “The Influence of Elevated Magnetic Fields on the Texture Formation of Melt-Processed Bi-2212”, Physica C, 336, 192, 2000. 81. P. J. Ferreira, H. Liu and J. Vander Sande; “Magnetic Field Induced Texture in High-Tc Superconductors”, IEEE Transactions on Applied Superconductivity, vol. 9, No.2, 2231, 1999. 82. P. J. Ferreira, I. M. Robertson and H. K. Birnbaum; “Hydrogen Effects on the Character of Dislocations in High-Purity Aluminum”, Acta Materialia, 47, 10, 2291, (1999). 85. P. J. Ferreira, H. Liu, and J. B. Vander Sande; “A Model for the Texture Development of High-Tc Superconductors under an Elevated Magnetic Field”, Journal of Materials Research, vol.14, 7, 1999. 87. H. Liu, P. J. Ferreira, and J. B. Vander Sande; “Processing Bi-2212/Ag Thick Films under a High Magnetic Field: On the Bi-2212/Ag Interface Effect, Physica C, 303, 3-4, 161 (1998). 89. P. J. Ferreira, I. M. Robertson and H. K. Birnbaum; “Hydrogen effects on the interaction between dislocations”, Acta Materialia, vol. 46, 5, 1749, (1998). 90. S. Hertzman, P. J. Ferreira, B. Brolund, “An Experimental and Theoretical Study of Heat-Affected Zone Austenite Reformation in Three Duplex Stainless Steels”, Metallurgical and Materials Transactions, vol. 28A:277, (1997). 91. P. Müllner, P. J. Ferreira; “On the Energy of Terminated Stacking-Faults”, Philosophical Magazine Letters, 73, 289 (1996). 92. P. J. Ferreira, I. M. Robertson and H. K. Birnbaum; “The influence of hydrogen on the stacking-fault energy of an austenitic stainless steel”, Materials Science Forum p. 98, (1996). A. Jarvis, Z.Q. Deng, L. F. Allard, A. Manthiram, and P.J. Ferreira, “Understanding Structural Defects in Lithium-rich Layered Oxide Cathodes by Aberration-Corrected STEM”, Microscopy and Microanalysis, 18 (suppl. 2), pp. 1414-1415, (2012). Jarvis, Z. Deng, A. Manthiram, P.J. 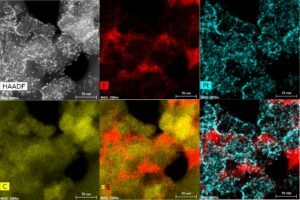 Ferreira, ”Understanding the Role of Lithium Content on the Structure and Capacity of Lithium-Rich Layered Oxides by Aberration-Corrected STEM, D-STEM, and EDS”, Microscopy and Microanalysis, 18 (suppl. 2), pp. 1484-1485, (2012). A. Stach, D. Su, P. Ercius, K. J. Ganesh, P.J. Ferreira, Y. Zhu, K. Yager, S. Murali, M.D. Stoller, W. Cai, Adam Pirkle, Robert M. Wallace, Katie A. Cychosz, Matthias Thommes, and R.S. Ruoff, “High-Resolution Characterization of Activated Graphene for Supercapacitor Applications”, Microscopy and Microanalysis, 18 (suppl. 2), pp. 1536-1537, (2012). J. Ganesh, S. Rajasekhara, D. Bultreys, P. J. Ferreira, “Rapid and Automated Grain Orientation and Grain Boundary Analysis in Nanoscale Copper Interconnects”, Reliability Physics Symposium, 2011 IEEE International, pp. 5C.2.1 – 5C.2.3. K Jarvis, Z Deng, LF Allard, A Manthiram, P Ferreira, “Structural Characterization of Li-Excess Cathode Materials for Lithium-Ion Batteries by Aberration-Corrected STEM and D-STEM”, Microscopy and Microanalysis, 17 (suppl. 2), pp. 1578-1589, (2011). J. Ganesh, A. Darbal, S. Rajasekhara, G. S. Rohrer, K. Barmak; P. J. Ferreira, “Characterizing Texture and Grain Boundaries in Nanoscale Cu Interconnects by Precession Electron Diffraction”, Microscopy and Microanalysis, 17 (suppl. 2), pp. 1346-1347, (2011). J. Groom, S. Rajasekhara, S. A. Matyas, Z. Yang, M. Gummalla, S. C. Ball, P. J. Ferreira, “The Effect of Particle Size on Pt/C Electrocatalyst Degradation in Proton Exchange Membrane Fuel Cells”, Microscopy and Microanalysis, 17 (suppl. 2), pp. 1616-1617, (2011). Darbal, K. J. Ganesh, K. Barmak, G. S. Rohrer, P. J. Ferreira, T. Sun, K. R. Coffey, “Grain Boundary Characterization of Nanocrystalline Cu from the Stereological Analysis of Transmission Electron Microscope Orientation Maps”, Microscopy and Microanalysis, 17 (suppl. 2), pp. 1416-1417, (2011). F. Rauch, K. Barmak, J. K. Ganesh, P. J. Ferreira, A. Darbal, D. Choi, T. Sun, B. Yao, K. R. Coffey and S. Nicolopoulos, “Automated Crystal Orientation and Phase Mapping for Thin Film Applications by Transmission Electron Microscopy”, Microscopy and Microanalysis, 17 (suppl. 2), pp. 1086-1087, (2011). J. Ganesh, S. Rajasekhara; D. Bultreys, K. Hattar, J. A. Knapp and P. J. Ferreira, “D-STEM Combined with Precession Microscopy for Nanoscale Crystal Orientation and Phase Mapping”, Microscopy and Microanalysis, 17 (suppl. 2), pp. 1090-1091, (2011). Rajasekhara, K. J. Ganesh, K. Hattar, J. A. Knapp, P. J. Ferreira, “The Influence of Film Thickness on the Microstructure of Nanocrystalline Nickel Films: A Precession Electron Diffraction Microscopy Study”, Microscopy and Microanalysis, 17 (suppl. 2), pp. 1080-1081, (2011). A. Asoro, D. Kovar, P. J. Ferreira, “In-Situ TEM Study of Sintering of Capped Silver Nanoparticles”, Microscopy and Microanalysis, 17 (suppl. 2), pp. 486-487, (2011). Rajasekhara, L.P Karjalainen, A. Kyrolainen and P. J. Ferreira, “Development of Stainless Steels with Superior Mechanical Properties: A Correlation Between Structure and Properties in Nanoscale/ Sub-micron Grained Austenitic Stainless Steel”, Proceedings of International Conference on Advanced Steels 2010, edited by Y. Weng, H. Dong and Y. Can, Metallurgical Press, pp. 357-370, (2010). Brian N. Patrick, Lawrence F. Allard, Yang Shao-Horn and Paulo J. Ferreira, “Aberration-Corrected STEM Image Simulation of Segregation in Pt3Co Nanoparticles for PEM Fuel Cells”, Microscopy and Microanalysis, 16 (suppl. 2), pp. 252-253, (2010). A. Jarvis, Lawrence F. Allard, Timothy Y. Jerome, Thomas C. Isabell, Douglas A. Blom and P.J. Ferreira, “Aberration-Corrected STEM Imaging Through Off-Site Remote Operation”, Microscopy and Microanalysis, 16 (suppl. 2), pp. 1330-1331, (2010). Rajasekhara, B. Neuner III, G. Shvets, P.J. Ferreira, D. Kovar, “Influence of the Microstructure on the Optical Properties of Silicon Carbide Films: A TEM Study”, Microscopy and Microanalysis, 16 (suppl. 2), pp. 1450-1451, (2010). J. Ganesh, S. Rajasekhara, D. Bultreys, J.P. Zhou, P.J. Ferreira, “Automated Local Texture and Stress Analysis in Cu Interconnects using D-STEM and Precession Microscopy”, Microscopy and Microanalysis, 16 (suppl. 2), pp. 1728-1729, (2010). A. Jarvis, J. Zhao, L.F. Allard, A. Manthiram, P.J. Ferreira, “Characterization of the Ternary Compound Pd5Pt3Ni2 for PEMFC Cathode Electrocatalysts”, Microscopy and Microanalysis, 16 (suppl. 2), pp. 1812-1813, (2010). Rajasekhara, L. P. Karjalainen, A. Kyröläinen, P. J. Ferreira, “Nano/sub-micron Grain Structures in Austenitic Stainless Steels”, 2nd International Conference on Steel Science, Kyoto, Japan, pp. 105-114, Oct. 2009. Jinho An, Jeff Pickering, K.J. Ganesh, P.J Ferreira, “TEM Measurements of Grain Orientation in Nanoscale Cu Interconnects using ACT”, Stress Induced Phenomena in Metallization, Book Series: AIP Conference Proceedings Volume: 1143, 166-171, (2009). A. Asoro, J. Damiano, P.J. Ferreira, “Size Effects on the Melting Temperature of Silver Nanoparticles: In-situ TEM Observations”, Microscopy and Microanalysis, 15 (suppl. 2), pp. 706-707, (2009). A. Asoro, D. Kovar, Y. Shao-Horn, L.F. Allard, P.J. Ferreira, “Determination of Sintering Parameters from In-situ Aberration-Corrected STEM Imaging of Coalescence in Pt Nanoparticles”, Microscopy and Microanalysis, 15 (suppl. 2), pp. 730-731, (2009). E. Carlton, P.J. Ferreira, “Are Dislocations Present in Nanoparticles? : Fourier Filtering Images obtained from In-situ TEM Nanoindentation”, Microscopy and Microanalysis, 15 (suppl. 2), pp. 736-737, (2009). J. Ganesh, M. Kawasaki, J.P. Zhou, P.J. Ferreira, “A STEM Parallel Diffraction Technique Applied to Nanomaterials”, Microscopy and Microanalysis, 15 (suppl. 2), pp. 752-753, (2009). M. Robertson, D. Lillig, P.J. Ferreira, “Revealing the fundamental processes controlling hydrogen embrittlement”, Jackson Hole, WY, March 2009. Simoes, R. Calinas, P.J. Ferreira, F. Viana, M.T. Vieira, M.F. Vieira, “TEM and SEM in-Situ annealing of nanocrystalline copper thin films”, Microscopy and Microanalysis, 14 (suppl. 3), pp. 49-52, (2008). J. Ferreira, L.F. Allard, S. Chen, N. Yabuuchi, Y. Shao-Horn, “Surface Segregation and Ordering in Pt3Co Nanoparticles Observed by Aberration-Corrected STEM”, Microscopy and Microanalysis, 14 (suppl. 2), pp. 218-219, (2008). Rajasekhara, P.J. Ferreira, L. P. Karjalainen, A. Kyröläinen, “Microstructure Evolution in Nano/Submicron Grained AISI 301 Stainless Steel”, TMS 2008 Annual Meeting Supplemental Proceedings Volume 3: General Paper Selections, pp. 257-268, New Orleans, March, (2008). Rajasekhara, P.J. Ferreira, L. P. Karjalainen, A. Kyröläinen, “Kinetics of α’→γ reversion in a cold-rolled AISI 301 LN Stainless Steel”, 6th European Stainless Steel Conference, Helsinki, Finland, pp. 483-488, (2008). Rajasekhara, P.J. Ferreira, L. P. Karjalainen, A. Kyröläinen, “Microstructure Evolution in Nano/Submicron Grained AISI 301 Stainless Steel”, 6th European Stainless Steel Conference, Helsinki, Finland, pp. 505-510, (2008). Rajasekhara, P.J. Ferreira, L. P. Karjalainen, A. Kyröläinen, “Kinetics of Grain Growth in Ultra-Fine Grained AISI 301LN Stainless Steel”, 6th European Stainless Steel Conference, Helsinki, Finland, pp. 511-517, (2008). Rajasekhara, L. P. Karjalainen, A. Kyröläinen, P. J. Ferreira, “Kinetics of grain growth in ultra-fine grained AISI 301LN stainless steel’ – International Symposium on Ultra-fine Grained Steels – October 2007, Kitakyushu, Japan. Rajasekhara, L. P. Karjalainen, A. Kyröläinen, P. J. Ferreira, “Kinetics of martensite to austenite phase reversion in cold rolled AISI 301LN Stainless Steel’, International Symposium on Ultra-fine Grained Steels – October 2007, Kitakyushu, Japan. Chen, P.J. Ferreira, Y. Shao-Horn, “Surface Segregation in Pt3Co Nanoparticles Characterized by Scanning Transmission Electron Microscopy”, Proceedings Microscopy Society of America, Florida, 13, S02, pp. 604-605 August 2007. J. Ferreira, Y. Shao-Horn, “Formation Mechanism and Characterization of Pt Single Crystal Nanoparticles in Proton Exchange Membrane Fuel Cells”, Proceedings Microscopy Society of America, Florida, 13, S01, pp. 606-607, August 2007. J. Ferreira, P. Szakalos, J.B. Vander Sande, “Formation of Carbon Nanofilaments by Metal Dusting”, Proceedings Microscopy Society of America, Florida, 13, S02, pp. 774-775, August 2007. E. Carlton, O. Lourie, P. J. Ferreira, “In-situ TEM Nano-Indentation of Individual Single-Crystal Nanoparticles”, Proceedings Microscopy Society of America, Florida, 13, S02, pp. 576-577, August 2007. Cheng, S. Lao, J. Yong, J. H. Koo, P. J. Ferreira, L. Pilato, G. Wissler, and Z.P. Luo “Cyanate Ester-Buckytubes Nanocomposites: Processing and Characterization”, SAMPE 2007 ISSE, Baltimore, Maryland (2007). E. Carlton, P.J. Ferreira, “What is behind the Inverse Hall-Petch Behavior in Nanocrystalline Materials”, in Size Effects in the Deformation of Materials — Experiments and Modeling, edited by E. Lilleodden, P. Besser, L. Levine, A. Needleman (Mater. Res. Soc. Symp. Proc. 976E, p.0976-EE01-04, Warrendale, PA, 2007). Rajasekhara, M. C. Somani, M. Koljonen, L. P. Karjalainen, A. Kyröläinen, P. J. Ferreira, ‘Sub-micron/nano grained stainless steels with superior mechanical properties’, MRS 2005 Fall Meeting, Boston, MA, USA, Vol. 903E, pp. 40.1-40.6. H. An, P.J. Ferreira, “In-situ TEM Study of Thermally Induced Voids in 180 nm Cu Interconnects”, MRS 2005 Fall Meeting, Boston, MA, USA, Vol. 907E, pp.03.1-03.6. E. Carlton, P.J. Ferreira, “Dislocation Instability in Nanoscale Particles”, MRS 2005 Fall Meeting, Boston, MA, USA, Vol.903E, pp. 0903-Z14-09.1-6. L. Johannsen, A. Kyrolainen, P.J. Ferreira, “Martensite Reformation in Nano/Submicron Austenitic Stainless Steels”, Iron & Steel, Vol.40, Joint Conference of HSLA Steel 2005, Sanya, China. Somani, P. Karjalainen, P. Juntunen, S. Rajasekhara, P. J. Ferreira, A. Kyröläinen, T. Taulavuori, P. Aspegren, ‘Microstructure and Mechanical Properties Achieved during Short Annealing of Cold-Rolled Austenitic Stainless Steels’, Iron & Steel, Vol.40, pp. 283-289, Conference of HSLA Steel 2005 and ISUGS, Sanya, China. Shao-Horn, P. J.Ferreira, G.J. la O’, D.D. Morgan, H.A. Gasteiger, R. Makharia, “Coarsening of P tNanoparticles in Proton Exchange Membrane Fuel Cells Upon Potential Cycling” the Electrochemical Transactions, 1, 185-195 (2005), Symposium on Durability and Reliability of Low-Temperature Fuel Cells and Fuel Cell Systems (X2) at the 208th Electrochemical Society Meeting, Los Angeles, October 16-21, 2005. Veiga, P.J. Ferreira, “Smart and Nano Materials in Architecture”, Smart Architecture: Integration of Digital and Building Technologies, Proceedings of the 2005 Annual Conference of the Association for Computer Aided Design In Architecture, Savannah, Georgia, 13-16 October 2005, pp. 58-67. Shao-Horn, P.J. Ferreira, G.J. la O, “Instability of Pt/C Electrocatalysts in Proton Exchange Membrane Fuel Cells: A Mechanistic Investigation”:, 2nd International Conference on Polymer Batteries and Fuel Cells, June 12-17, Las Vegas, Nevada, 2005. H. An, P.J. Ferreira; “In-situ TEM Studies of Nanoscale Cu Interconnects Under Thermal Stress”, MRS Symp. Proc. Vol.854E, pp. U11.13.1-6 (2004). J. Ferreira and J. Vander Sande; “A Mechanism for Magnetically Driven Shape Memory Alloys”, Materials Research Society Symposium Proceedings, Vol. 604, p.291, (1999). J. Ferreira, H. Liu and J. Vander Sande; “Magnetic Field Induced Texture in High-Tc Superconductors”, Applied Superconductivity Conference, Palm Desert, CA, 1999. Teter, P. J. Ferreira, I. M. Robertson and H. K. Birnbaum; “An Environmental Cell TEM for Studies of Gas-Solid Interactions”, in New Techniques for Characterizing Corrosion and Stress Corrosion, TMS Fall Meeting 95, ed. R.H. Jones and D.R. Baer, Cleveland, Ohio. TMS, Warrendale, PA, p 53, 1995. RFA Jargelius Pettersson, S. Hertzman, P. Szakalos and P. J.Ferreira; “The influence of microstructure on pitting corrosion in autogenous TIG duplex stainless steel welds”, in Proc. of Fourth International Conference on Duplex Stainless Steels, Glasgow, Scotland, Nov. (1994). J. Ferreira; “On the determination of Stacking Fault Energy from Dislocation Nodes Observed by TEM”, Proceedings of International Conference of the Microscopy Society of America, pp 686, New Orleans, Louisiana, July/August (1994). J. Ferreira, S. Hertzman ; “d-Ferrite Grain Growth in Simulated High Temperature HAZ of duplex stainless steels”, in Proc. of International Conference on Duplex Stainless Steels, Vol. 2, Beaune, France, 28-30 Oct., (1991). P.J. Ferreira, Ph.D Thesis, “Hydrogen Effects on Crystal Dislocations”, University of Illinois, Urbana, (1997). In-situ Electron Microscopy, (On-line Proceedings), MM Symposium, MRS Fall Meeting 2005, 1 volume, edited by Paulo J. Ferreira (University of Texas at Austin), Ian M. Robertson (University of Illinois), Gerhard Dehm (University of Leoben, Austria) and Hiroyasu Saka (Nagoya University, Japan). Materials: Years 2000, edited by M.A. Fortes (IST, Portugal) and P.J. Ferreira (University of Texas at Austin), Instituto Superior Tecnico/Univ. Of Texas, 1st edition, 1 volume, 546 pages, Marco 2003, published by IST Press, English/Portuguese. Investing In The Future: University-Industry Collaborations in Portugal and USA, edited by P.J. Ferreira (University of Texas at Austin), J. Tavares (Universidade Nova de Lisboa, Portugal), N. Vasconcelos (University of California at San Diego) and F. Veloso (Carnegie Mellon University), PAPS/ FLAD, Cambridge, MA, 1st edition, 161 pages, Maio 2003, published by Gradiva Publicacoes Limitada, Portuguese. Rajasekhara,L.P Karjalainen, A. Kyrolainen and P. J. Ferreira, “Development of Stainless Steels with Superior Mechanical Properties: A Correlation Between Structure and Properties in Nanoscale/ Sub-micron Grained Austenitic Stainless Steel”, “Advanced Steels: The Recent Scenario in Steel Science and Technology”, published by Springer, editors are Yuqing Weng, Han Dong, Yong Gan, pp. 371-384 (2011). V Sivaprasad, Saroja Saibaba and P. Shankar, pp. 221-233 (2009). J. Ferreira, “High Tc Superconductor Materials”, Materials: Years 2000, pp. 269-275, edited by M.A.Fortes and P.J. Ferreira, Instituto Superior Tecnico/Univ. Of Texas, 1st edition, 1 volumes, 546 pages, March 2003, published by IST Press, Portuguese. J. Ferreira, J. Tavares, N. Vasconcelos, F. Veloso and Pedro Conceicao, “Investir No Futuro: Relacoes Universidade Industria”, Investing In The Future: University-Industry Collaborations In Portugal And USA, pp. 11-33, PAPS/ FLAD, Cambridge, MA, 1st edition, 161 pages, Maio 2003, published by Gradiva Publicacoes Limitada, Portuguese. J. Ferreira, “Nanotechnology”, Engineering In Portugal During The 20th Century, edited by Jose Brito, Manuel Heitor and Maria Rollo, published by Dom Quixote, Vol.1, pp. 575-585, 2004. J. Ferreira, “Ferromagnetic and Paramagnetic Materials”, Nova Activa Multimedia Encyclopedia, Lexicultural Press, pp. 220-221, 2004. J. Ferreira, “Nanotechnology”, Nova Activa Multimedia Encyclopedia, Lexicultural Press, pp. 230-231, 2004. “The Science of the Small: Understanding Coalescence of Nanoparticles by Advanced Transmission Electron Microscopy”, International Conference “NanoSpain 2016”, Logrono, Spain, March 2016. “Nano/Submicron Austenitic Stainless Steels with Superior Mechanical Properties”; Conference “International Conference on Advanced Steels 2010”, Guilin, China, November 2010. “Nano/Submicron Grained Stainless Steels”, International Symposium on “Advances in Stainless Steels 2007”, Chennai, India, April 9-11, 2007. In-situ and High-Resolution Transmission Electron Microscopy Applied to Nanomaterials”, International Conference “Global Materials for the XXI Century: Challenges to Academia and Industry, “, Porto, Portugal, April 1-4, 2007. “Understanding the Surface Structure of Li1-x[Mn2]O4 by Aberration Corrected STEM and EELS”, MRS Spring Meeting, Phoenix, Arizona, April 2-6, 2018. Seminar, “Understanding Nanomaterials by TEM”, Paul Sherrer Institute, Zurich, Switzerland, February 23, 2018. “Understanding the Surface of LiMn2O4 Spinel Cathodes with Aberration-Corrected HAADF STEM and EELS”, Conference, “Electronic Materials and Applications 2017”, American Ceramic Society, Orlando, Florida, January 18-20, 2017. “Texture and phase analysis in nanocrystalline Ni thin films by precession electron diffraction microscopy”, Conference, “SPB Mat2016, Symposium F – Advanced and Analytical Microscopy and Spectroscopy of Nanostructures and Engineering Materials, Campinas, Brazil, 25-29 September, 2016. “A Study of Texture during Grain Growth of Nanocrystalline Ni Thin Films”, 13th FEMS Junior Euromat Conference – Tutorial – Functional Coatings, Lausanne, Switzerland, July 14, 2016. Seminar, “Seeing Small: Understanding the Behavior of Nanoparticles by Advanced Transmission Electron Microscopy”, Instituto Superior Tecnico, Lisbon, Portugal, May 9, 2016. Colloquium, “Living with Complexity: The Value of Interdisciplinarity”, University of Porto, October 15-16, 2015. “Seeing small: Enabling new discoveries in materials through advanced transmission electron microscopy”, Universidad de Complutense, Madrid, Spain, April 13, 2015. Seminar, “Seeing small: Enabling new discoveries in materials through advanced transmission electron microscopy”, University of Houston, Houston, Texas, November 18, 2014. Seminar, “Seeing small: Enabling new discoveries in materials through advanced transmission electron microscopy”, Iberian Institute of Nanotechnology, Braga, Portugal, Sept. 19, 2014. “Are Dislocations Possible in Nanoparticles?”, 3rd Congress of International Union of Crystallography, Montreal, Canada, 5-11th August, 2014. “Thermal Behavior of Metallic Nanoparticles: An in Situ TEM Study”, Zing Conference, Nanocrystals, Dominican Republica, 14-17th July, 2014. Seminar, “Thermal Behavior of Ag Nanoparticles”, Department of Materials Science and Engineering, Universidade Federal do Rio de Janeiro, Brazil, 20th February, 2014. “Thermal Behavior of Nanoparticles”, 12th Inter-American Congress of Microscopy, Cartagena, Columbia, 24th-28th September, 2013. “Thermal Behavior of Metallic Nanoparticles: An in Situ TEM Study”, Frontiers of Electron Microscopy in Materials Science, Lorne, Australia, 8th-13th September, 2013. Seminar, “Seeing small: Enabling new discoveries in materials through advanced transmission electron microscopy”, Aalto University, Helsinki, Finland, June, 2013. “Seeing small: Enabling new discoveries in energy materials through advanced transmission electron microscopy”, American Chemical Society 245th National Meeting, New Orleans, April, 2013. “Behavior of Pt and Pt3Co nanoparticles in PEM fuel cells observed by high-resolution TEM, aberration-corrected STEM, and in-situ”, American Chemical Society 245th National Meeting, New Orleans, April, 2013. “Understanding the role of excess Li on the atomic structure and capacity of lithium-rich layered oxides”, American Chemical Society 245th National Meeting, New Orleans, April, 2013. Seminar, “Seeing Small: Enabling New Discoveries In Li-Ion Batteries and Fuel Cells through Transmission Electron Microscopy”, Argonne National Laboratory, Argonne, Ilinnois, October 23, 2012. “Sintering of Nanoparticles: In Situ TEM Studies”, Materials Science and Technology Conference, Pittsburgh, PA, October 8, 2012. Seminar, “Seeing Small: Enabling New Discoveries through Transmission Electron Microscopy”, Department of Physics, Kharkov University, Kharkov, Ukraine, Sept. 1, 2012. “Dislocations in Individual Nanoparticles: An In Situ TEM Nanoindentation Study” XI Nanomaterials conference on Nanostructured Materials, Rhodes, Greece, August 2012. Seminar, “Seeing Small: Enabling New Discoveries through Transmission Electron Microscopy”, Department of Materials Science and Engineering, University of Pennsylvania, PA, February 2012. “Structural Characterization of Li-Excess Cathode Materials for Batteries”, 11th Interamerican Congress on Microscopy, Merida, Mexico, September 2011. “Dislocations and Surfaces Studied by In Situ Aberration-Corrected TEM/STEM”, 3rd International Workshop on Remote Electron Microscopy and In Situ Studies, Carnegie-Mellon University, Pittsburgh, June 6-8, 2011. Seminar, “Atomic Structure and Defect Behavior of Nanoparticles through Aberration-Corrected STEM, High-Resolution TEM and In-situ TEM”, Materials Science and Engineering Program, Texas A&M University, College Station, TX, October 2010. “Behavior of Pt and Pt3Co Nanoparticles in PEM Fuel Cells Observed by High-Resolution TEM, Aberration-Corrected STEM and In-situ TEM”, Conference, “17th International Microscopy Congress, Rio de Janeiro, Brazil, September 2010. Seminar, “Are Dislocations Possible In Nanoparticles”, Department of Materials Science and Engineering, Pontificia University Catholic, Rio de Janeiro, Brazil, September 2010. “Are Dislocations Possible in Nanoparticles”, 2010 APS/EMC Users Meeting, Argonne National Laboratory, IL, May 2010. “Development of Stainless Steels with Superior Mechanical Properties: A Correlation Between Structure and Properties in Nanoscale/ Sub-micron Grained Austenitic Stainless Steel “2nd International Conference on Steel Science”, Kyoto, Japan, October 2009. “Atomic Structure of Pt-based Nanoparticles for Fuel Cells through Aberration-Free STEM, High-Resolution TEM and In-situ TEM Conference,”, “XVIII International Materials Research Congress 2009”, Cancun, Mexico, August 2009. Seminar, “Atomic Structure and Defect Behavior of Nanoparticles through Aberration-Free STEM, High-Resolution TEM and In-situ TEM”, University of Puerto Rico, Puerto Rico, March 2009. “Thermal Stress Induced Voids in Nanoscale Cu Interconnects by in-situ TEM Heating”, 10th International Workshop on Stress-Induced Phenomena In Metallization, Austin, TX, November 2008. “Self-Healing Nanoparticles: In Situ TEM Nanoindentation”, Workshop, “2008 European in Situ TEM probing”, Goteborg, Sweden, October 2008. Seminar, “In Situ Transmission Electron Microscopy”, PASI School in Microscopy, Cancun, Mexico, August 2008. “In situ Transmission Electron Microscopy”, Conference, Texas Society of Microscopy, Spring 2008 Meeting, University of Texas at Austin, April 2008. “Atomic Structure and Defect Behavior of Nanoparticles through Aberration-Free STEM, High-Resolution TEM and In-situ TEM” Conference, INCOMAM-07, International Conference on Microscopy and Microanalysis, Coimbra, Portugal, December 2007. Seminar, “Nanomaterials and Nanostructures – Applications to Molecular Electronics and Biotechnology”, University of Texas at Austin, October 2007. Seminar, “Atomic Structure and Defect Behavior by Aberration-Free STEM, High-Resolution TEM and In-situ TEM”, National University of Engineering, Lima, Peru, Sept. 2007. “Aberration-Free STEM, High-Resolution TEM and In-situ TEM Applied to Catalyst Pt and Pt-based Nanoparticles for Fuel Cells”, Conference, “9th Inter-American Congress of Electron Microscopy”, “, Cusco, Peru, September 2007. “In-situ Transmission Electron Microscopy on Cs-Corrected TEMs”, Symposium on “Electron Microscopy at Sub- Angstrom Resolution”, Austin, TX, March 7, 2007. “In-situ Transmission Electron Microscopy: Mapquest for Materials Conference”, CBECIMAT, Foz do Iguacu, Brazil, November 18, 2006. “In-situ Transmission Electron Microscopy: Mapquest for Materials”, Nano/Materials Science Seminar, University of Texas at Austin, April, 2006. “Government-Industry-University Relationships in a Global Economy”, Conference, “Engineers for a Sustainable World”, Austin, TX, October 8, 2005. Seminar, “Research & Development: Effects of Scale on The Economy”, University of Minho, Portugal, by Video Conference, October 6, 2005. Seminar, “In-situ TEM Studies of Nanoscale Cu Interconnects under Thermal Stress”, Howard’s Birnbaum Symposium, University of Illinois, June 2005. Seminar, “Science and Technology in the World: A Comparison”, Portuguese Ministry of Economics and Innovation, Lisbon, Portugal, August 2005. Seminar, “Carbon Nanostructures Formed by Metal Dusting”, Winstead Sechrest & Minick P.C, Austin, TX, April 2005. Seminar, “In-situ Transmission Electron Microscopy”, Brookhaven National Laboratory, Long Island, NY, April 2005. Seminar, “Seeing Small: In-situ and High Resolution Transmission Electron Microscopy Applied to Nanomaterials”, NASA Center for Applied Radiation Research, Prairie View, TX, April 2005. Seminar, “Texture Development in High-Temperature Superconductors”, CEPEL, Rio de Janeiro, Brazil, March 2005. Seminar, “Transmission Electron Microscopy Applied to Crystalline Defects”, PUC, Rio de Janeiro, Brazil, March 2005. Seminar, “High-Velocity Forming of Nano/Submicron Stainless Steels”, University of Oulu, Oulu, Finland, August 2004. Seminar, “Development of Nano/Submicron Stainless Steels”, University of Oulu, Oulu, Finland, June 2004. Seminar, “Nanotechnology: Science or Fiction”, Univ. of Coimbra, Coimbra, Portugal, July 2003. Seminar, “Microstructure Development of Stainless Steels During High Velocity Deformation“, Swedish Institute for Metals Research, Stockholm, Sweden, June 2003. Seminar, “Microstructure Development of Stainless Steels During High Velocity Deformation”, University of Texas, Aeronautic and Aerospace Eng. Dept., Austin, TX, April.2003. Seminar, “Nanotechnology: Science or Fiction?” UT Quest “Physics Today and Tomorrow Series”, Austin, TX, Jan.2003. Seminar, “Nanotechnology: Science or Fiction?”, University of Porto, Porto, Portugal, Jan. 2003. Seminar, “In-situ Transmission Electron Microscopy Applied to the Study of Crystalline Defects”, University of Tokyo, Tokyo, Japan, Nov. 2002. “Applied Magnetic Field Effects on Materials Behavior” Conference on Innovative Materials Processing by Controlling Chemical Reaction Field, “ Magnetic Field Effects on Materials Behavior” Miyagi, Japan, November 2002. Seminar, “Applied Magnetic Field Effects on Materials Behavior”, Swedish Institute for Metals Research, Stockholm, Sweden, March 2002. Seminar, “Microstructure Development During Plastic Deformation”, Helsinki University of Technology, Finland, May 2001. Seminar, “Relationship between Microstructure and Properties in Magnetically Driven Materials”, Russian Academy of Sciences, Institute of Solid State Physics, Chernogolovka, Moscow, Russia, May 2001. ZnFe Galvanic Nanostructures for Multifunctional Properties: Oxygen Scavengers, Chromatic sensors and Antibacterial agents with Dr. Sebastian Calderon (INL) and Prof. Sandra Carvalho (Univ. of Minho). ZnFe Bimetallic Nanoparticles a) Phase contrast Image, b) FFT of a), c) HAADF STEM image d) EDX spectrum images acquired for Zn and Fe. The development of materials sensitive to oxygen and able to detect it is one of the main aims in the packaging industry, even 2% residual oxygen concentration may alter food organoleptic properties. The presence of oxygen in the packaging, as well as the permeation of oxygen during storage is avoided by using oxygen scavenging materials and controlled by using packaging materials with low permeability to gases. Most of the commercial active agents used on packaging materials are dispersed in the film matrix or/and used as sachet, cards, and self-adhesive labels that can lead to an inefficient activity of the active compound. Thus, the incorporation of the oxygen scavengers in the packing materials avoids the necessity of additional components. However, the use of these materials do not give information of the level of oxygen inside the packaging or avoid the microbial growth during storage that can happens in the presence of oxygen, and thus acting as intelligent and active packaging. This project addresses the development of a new generation of active and intelligent packaging film for foods through the dispersion of nano-sized multifunctional particles in a bio-polymeric matrix. Enhanced oxygen absorption capacity, as well as high absorption kinetics are expected by alloying Fe and Zn nanoparticles (NPs) by exploiting the larger reduction potential of Fe and by inducing a controlled oxidation of Zn through consumption of oxygen and water present in the package material. After Zn consumption, Fe can also convert into oxide consuming any remaining oxygen inside the package. The nano-sized multifunctional particles confer to the package not only the ability to absorb oxygen permeating from the environment, but also produces ZnO, an antimicrobial agent extensively used in the food industry, that prevents microorganism proliferation. The formation of ZnO is critically dependent on the amount of oxygen and humidity, and is thus automatically controlled by the environment. The increasing number of oxidized NPs in the package induces a change in colour, producing a chromatic effect as a function of oxygen absorbed and antimicrobial agent produced.